Deep Web – how to get to the hidden network? Have you ever heard about the mythical hidden place on the Internet? Of course, I’m talking about darknet. Recently, one of my friends asked me how to get to the deep web, so in today’s short entry I will help you to understand what the Deep Web is and how, to get into it. The internet is a much, much bigger place than you probably realize. You know about Facebook, Google, BBC iPlayer and Amazon, but do you really know what’s lurking beyond those user-friendly and respectable websites? Let’s take a tour to help you make up your mind. To use this anonymous dark you will need one tool – the Tor Browser. The application is designed for Microsoft Windows, Linux and Mac. Contrary to the clearnet, Tor uses the anonymous network, which ensures a high level of anonymity for every Internet user. Unfortunately, this network performance is not as fast as the clear web due to its functioning, which results in the slower load of the web pages. How to enter the DeepNet? The is actually very simple. All you have to do is download the Tor Browser from the official website and then load any page with the .onion domain. If we tried to get into Deep Web using a normal browser without Tor proxy, we would not be able to do it. The entire Tor guide will be available in our next blog post: How to change your IP. There is also an option of buying a hosting server or setting up your own website server in the deep net network. What will we find in darknet? Despite the information published by the media in relation to the Tor network, this is not an illegal Internet for criminals. Mass media often put about drug stores, pedophiles, bandit guides, and weapons. The truth is that we will find normal materials in a hidden network. It is not a criminal network, it is simply criminals who have adapted it for their purposes, for example, selling marijuana or bank accounts. An example of this may be quite a famous Hydra Forum. It’s enough to remember that hidden internet is, in simplification, a network which is hidden from a standard internet search engines such as Google, Yahoo or Bing. The content of these materials is not important, it can even be a forum for secret fans of ‘My Little Pony’. You can easily set up a beauty blog on the darknet. 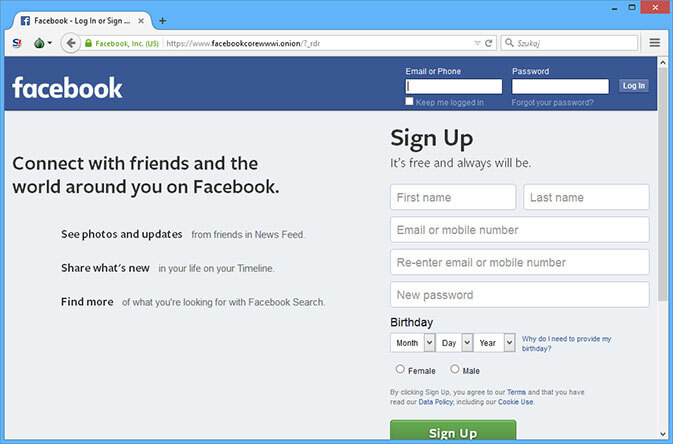 It’s worth adding that even Facebook has an official website in the anonymous network. Unfortunately, there is no good search engine for hidden network resources with would be similar to Google. Most of these tools are regular directories with links to pages in the .onion domain. If you’re looking for a website you may have an impression to be back in time as the search is being done most often among annually added pages by the author of the search engine. It works really like our first archaic search engines. Yes! There was no Google at the time! The links could be found on diverse forums / instant messengers / sms, or on specially created pages where people were posting t there successively links to your favorite websites. The first version of Google worked in the same way. Several types of search engines could be found on the site deep-web.org. If you are ambitious, create a search engine for the hidden networks with some advanced ranking algorithms :-). There is a whole range of pages with legitimate content on the deep web, just look at Google links to pages with the extension .onion. This entry was posted in General, IT and tagged access, amazing, awesome, computer, computing, dark web, data center, database, DC, deep, dep web, geek, hacker, hacking, hosting, how to, IDC, interesting, internet, IP, news, proxy, science, server, servers, tech, technology, Tor, waw, web. Bookmark the permalink.